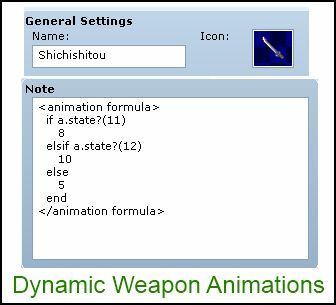 This script allows you to dynamically determine a weapon’s animation. When using a skill or item, you can choose to show a “normal attack” animation. This will tell the engine to use the animation that you have selected for the weapon. However, sometimes this is not enough. You might want a single weapon to show different animations depending on factors such as the current state or who the actor is. By using dynamic weapon animations, you can use formulas to determine which animation will be played based on a variety of conditions. that you want to use. Remember that your formula must always return an ID. There is no default ID. Is there a way to define multiple animations that are played in sequence within a single formula, or perhaps simultaneously? So as to, for example, show a character bust on screen, and then reference a different battle animation for the actual special effect? That would cut down greatly on the number of different permutations of animations that&apos;d be needed, which would likely violate the database&apos;s max of 999 anyway. I&apos;m guessing there&apos;s a chance that this might do that anyway if you put multiple numbers in sequential rows under each If statement, but haven&apos;t tested it. By default (as in, without additional animation-related scripts), no. The way animations are done is that each sprite can only have one animation playing at a time. You could potentially play them in sequence, but you would need to be able to queue them up, which is also not supported by default. I want to make the weapon&apos;s animation based on which actor it is equipped on, as the weapon can be used by many actor&apos;s who each have different elements. What&apos;s the formula I should use? Also, by any chance is there a way to change the element of a weapon based on actor? No, I don&apos;t have a script for dynamic damage elements. Okay, I know how to work this with states, but how do I work this with specific armor? However if you’re working with instance items that might not work. Okay, I’m now wondering what the weapon equivalent to ‘a.armors.include? ($data_armors)’ is. It’s not for this exact script, it’s for a different matter relating to Yanfly’s ‘Skill Restrictions’ script. Could one just use a rand(3) and have it do a random animation out of 3 different types? Also is there a way to check for critical hit and have a special animation on critical hit? Critical requires access to the target, which this script does not have.